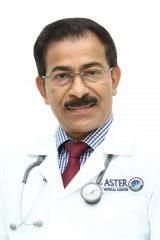 Dr. Sabu completed his MBBS (1988), MD(1993) and DM(1997) from Calicut University. He has more than 20 years of experience post acquiring his DM, and he was associated with Ernakulam Medical Centre, Ernakulam, India before joining with Aster DM Healthcare. He joined Aster DM Healthcare in June 1999 working as a Consultant Gastroenterologist in Aster Jubilee Medical Complex, Bur Dubai, Dubai. 1997 – ERCP training from PVS Hospital, Cochin. 2012 – Endoscopic Ultrasound Training, Magdeburg University, Germany. 2014 – IBD Training, Oxford General Hospital, Oxford (UK).